2. – 3. Even though Miss M didn’t do very much of her “regular” school work this week (due to expert day and other distrctions), Mr E still managed to do 4 lessons of RightStart C and 3 lessons from Logic of English Foundations. The “Silent E” board game was a lot of fun! 4. With everything going on this week, we decided to take a “fun school” day today — we played Corners, read Life of Fred Butterflies and Grammar Land, and now the big kids are outside playing. 5. Mr. E also started work on HIS expert day project today. His class will present at co-op in two weeks. He is doing a project on Lego Star Wars. I taught him how to cut and paste from google images so he could find some pictures for his display board. We also started trying to figure out how many sets have been produced (236 up through 2011, but we’ll have to do some counting of other lists to update that number through 2013). 8. Cute pic of the three boys — they like to sit on the warm heat vent in the dining room floor early in the morning! After Miss M requested we not do a second consecutive read aloud about the Underground Railroad, I decided to jump back to topic from our previous US History unit. It’s really a “sideways” jump timeline-wise since we are in California in the Gold Rush era for this read-aloud. I originally had another gold rush-themed book on our book list, but that one had to go back to the library before we had a chance to read it. I had forgotten about By the Great Horn Spoon by Sid Fleischman while making the list for the Pioneers/Westward migration unit. But then when we needed another book to read, this one came to mind. Tristan had mentioned this in a post earlier this winter as a favorite she wants to revisit with her family and then my memory was again jogged by a couple of recent forum threads where this title was mentioned. By the Great Horn Spoon follows Jack and his loyal butler Praisworthy as they travel by boat to California to seek their fortune in the gold fields and hopefully pay off family debts. A good part of the book takes place on their months-long journey around South America to California, as they unmask a thief, race another ship heading to San Francisco and even help some fellow passengers solve a difficult conundrum involving spoiling potatoes and dying grapes vines. Once they arrive in San Francisco, their adventures continue as they try to make their fortunes. They find clever ways to make money, outsmart a burly fighter and make memorable friendships. While I am not sure how this book rates on the “historical accuracy” scale….my guess is it’s not the most accurate gold rush-themed fiction choice. 😉 But it is certainly FUN! This action-packed story is quite happy for the most part (though the happy endings are not always exactly what you might expect). Miss M was so excited about this book she just couldn’t bear to wait until our next read-aloud time and read some of it on her own. This is a fine independent reading choice for mid-elementary-age students, and even younger kids would enjoy it as a read-aloud (I wish I would have included the boys in this read aloud, as they would have enjoyed it too…I’ll have to read it to them at some point in the near future!). 1. and 2.: Making a paper mache “Princess Leia Bird” (from Angry Birds Star Wars” for Mr. E’s birthday party. It could have been a Pinata, but…who wants to smash something like that — that, and it’s not really “pinata weather” here yet! 3. Yes, it snowed again here last Monday! Only about three inches this time! 4. This was the First Day of Spring for 2013. On the first day of spring in 2012, the kids were climbing the tree in a neighbors yard wearing shorts and t-shirts. It was an exceptionally early spring last year but….really? This is an awfully cold start to spring, even for MN! 5. and 6.: our first Snap Circuits set — an early birthday present for Mr. E from Grandma Karen. The set is a huge hit! 7. and 8.: Trip to the Children’s Museum on Tuesday with Grandma. 9. 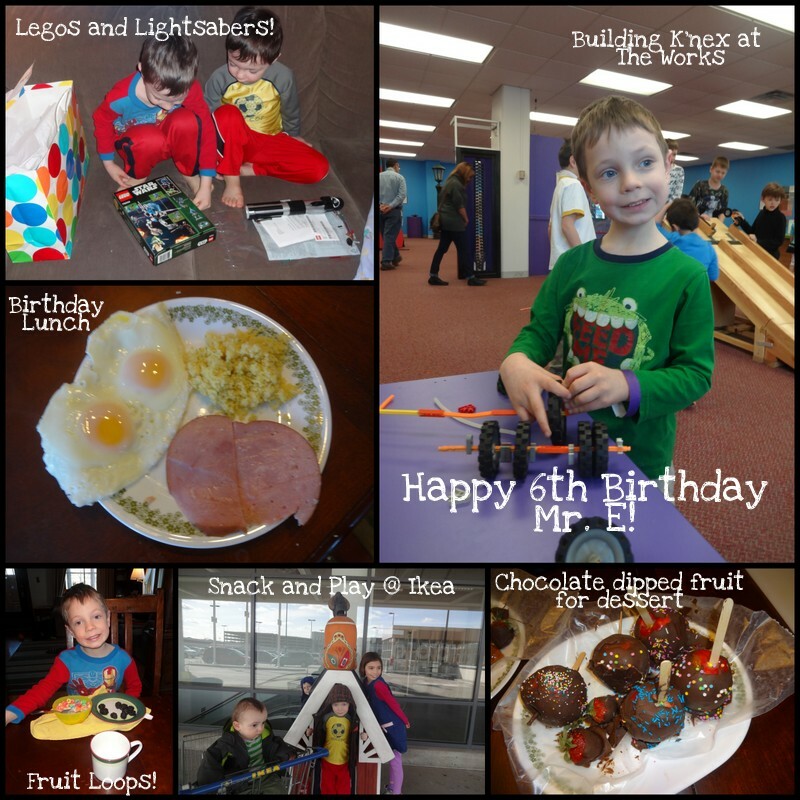 Mr E’s birthday party with friends on Saturday afternoon. 3. 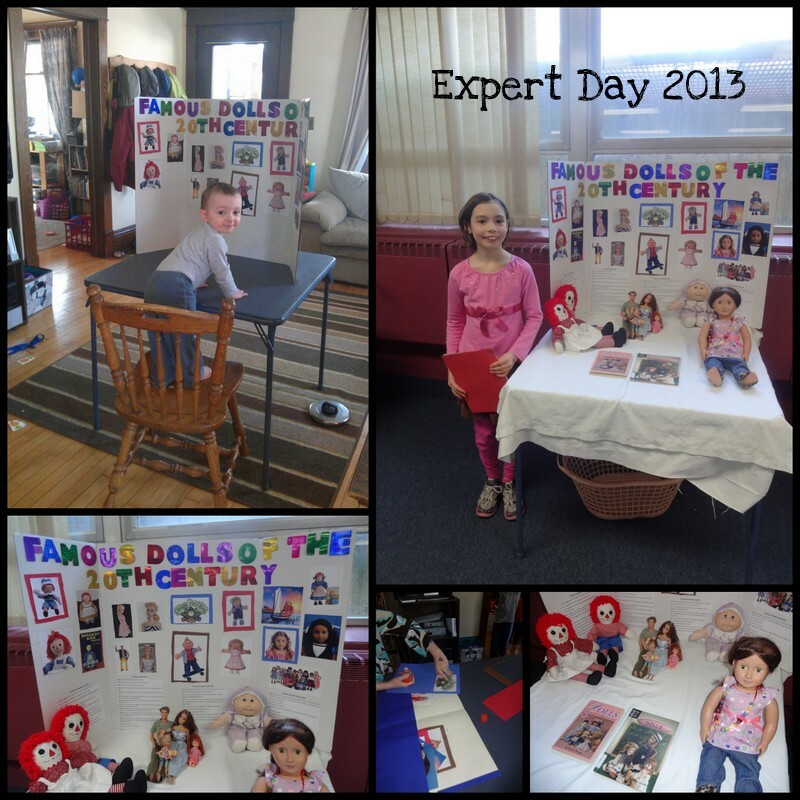 Miss M has been busily preparing for her “Expert Day” presentation at co-op…it’s coming up this Thursday. Here she is searching google images for pictures of the dolls she is talking about in her presentation. 4. and 5.: Mr. K (age 4, Pre-K) is keeping busy with Kumon cutting books, Preschool busy bags, and his Little Lambs preschool art book. 6. Mr. E writing spelling words on the magnadoodle board. He completed three lessons in Logic of English Foundations. Miss M had a review week in Logic of English Essentials. She didn’t feel as confident as we had hoped she might on her review words, so we may take another review week before moving on to lesson 31. 7. In math this week, Mr. E completed a couple more lessons of RightStart C — still mostly review. Miss M worked on fractions in Right Start D. I just love how RightStart presents fractions. It makes me fall in love with RightStart all over again, even if it is not a perfect fit for Miss M’s learning style. 8. and 9.: I feel like we are having a bit of a math game renaissance here. I am finally after multiple years with RS as my math curriculum being convinced that the games really are excellent practice and worth making time for. Mr. E and I played “Go to the Dump” and Advanced Addition War. Miss M and I played the fraction game “One” as well as multiple games of Fraction War. The weekend is over and we are looking forward to another busy week with Mr. E’s birthday, Miss M’s expert day at co-op, Easter weekend and my editing deadline! 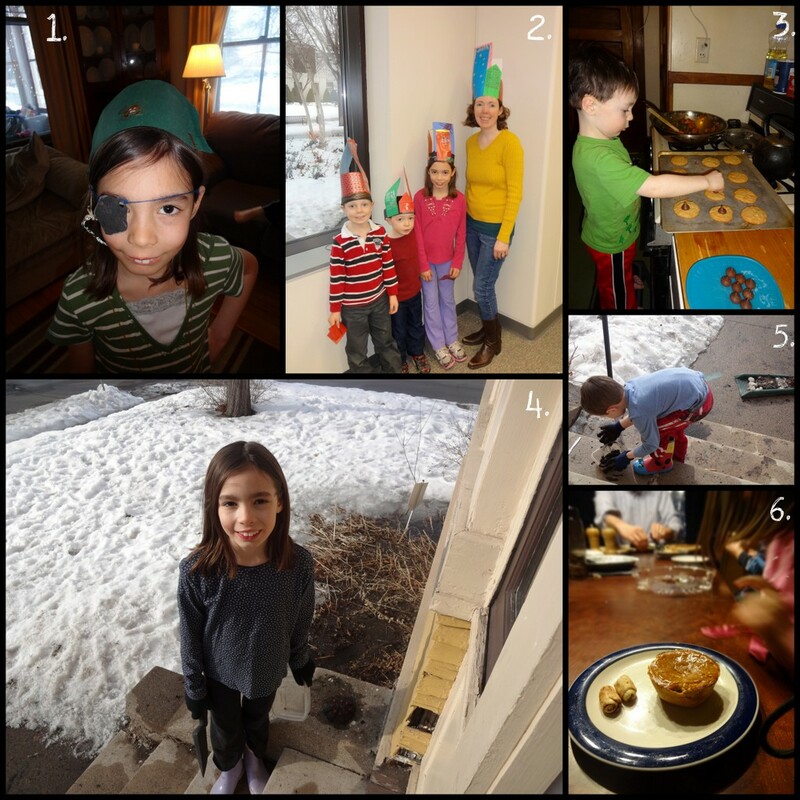 I still hope to sneak in a post or two on the blog…but if I don’t, you’ll know why!!! Linking up with Collage Friday @ Homegrown Learners! For our US History studies, we’re currently doing a short unit on slavery and the Underground Railroad before moving on to the Civil War. I had a little bit harder time selecting a longer read aloud to go along with this unit. I checked my usual sources, and I found plenty of picture books…and many chapter books that seemed a bit too mature for Miss M, my third grader. I was somewhat interested in Brady by Jean Fritz (since we have enjoyed many of her other books), but I wasn’t sure when that book would arrive since I was on a waiting list for one of two copies our library system owns of that title. I decided to go with a recommendation I got on a forum for Trouble Don’t Last by Shelley Pearsall. Set in 1859, Trouble Don’t Last tells the story of two slaves running away from a master in Kentucky. Samuel is an 11-year-old boy who never planned on running away. He is awakened in the middle of the night by Harrison, a much older slave, and dragged along a bit unwillingly as the two sneak away from their master’s farm. The entire book is the story of their journey — hiding in trees and bushes, being helped across the river to Ohio by a former slave, being hidden in a cellar, a church and a peddler’s wagon on the underground railroad, stumbling into a settlement of free black people (some people here are helpful while others are downright unfriendly), and even hiding on a real railroad car to move more quickly toward freedom in Canada. Trouble Don’t Last definitely kept us intrigued and wondering what would happen next on Samuel and Harrison’s journey. Pearsall also reveals more about each of the main characters as they continue on their journey — their “back-story” and their connection to one another. I thought this book was a nice mix of describing some of the horror that happened to slaves (such as being beaten or whipped), while not going overboard with descriptions that would not be appropriate for an elementary school audience. These are brought in as stories of what happened to Harrison and others in the past — not emotionally-charged incidents happening during the time frame of the story (something I was concerned about with other books on this topic I passed over). Before this unit in our history studies, I have to admit I did not know very much about this topic. With just a cursory understanding of the Underground Railroad, it was easy for me to have the impression this was something super-well organized that everyone who needed to know about it somehow just knew how the operation worked. Of course, that was not the case! The Underground Railroad was a broad network of individuals who mostly didn’t know each other and maybe were just barely willing to do their part. Slaves had just heard vague stories and knew maybe a certain direction to head — they may not have even known if they would get help or not on the way. Trouble Don’t Last portrays that quite well — Samuel and Harrison know to head north (and, as it turns out, do have a particular destination in Canada in mind), and aren’t quite sure how they will make it all the way to freedom. They are as surprised as anyone to end up in the basement of a “fancy white people’s church” or to be hiding on a railroad car — they’ve never even seen a real train before! Some of the people helping them seem to have their reservations about their part in helping slaves to freedom — the widow just across the border in Ohio helps because she thinks it what her dead husband would want her to do. A peddler helping the escaping slaves seems to have his own angle as well and at any sign of trouble is eager to be done with them. Overall, I was quite pleased with this choice for a read-aloud on the topic of the Underground Railroad. We started a second book to correlate with this unit that we were less pleased with and did not finish — but that’s maybe a topic for another post. After an intense couple of weeks of reading Trouble Don’t Last, as well as a large stack of picture books on slavery and the Underground Railroad, Miss M was ready to move on and asked we not start another read-aloud on this topic. Brady by Jean Fritz finally did arrive at our library — I guess I may take a look at it myself and make note of whether we will read it at a future time. Last year I spent a few months doing the weekly “Blogging through the Alphabet” challenge at Ben and Me. I didn’t quite make it through all the letters, but it was a lot of fun. I wasn’t quite ready to start all over again right away…but now that I have sat out the last 26 weeks, I am ready to start again with Round 3 of Blogging Through the Alphabet! My “A” is for “Apples”…but not just any kind of apples. 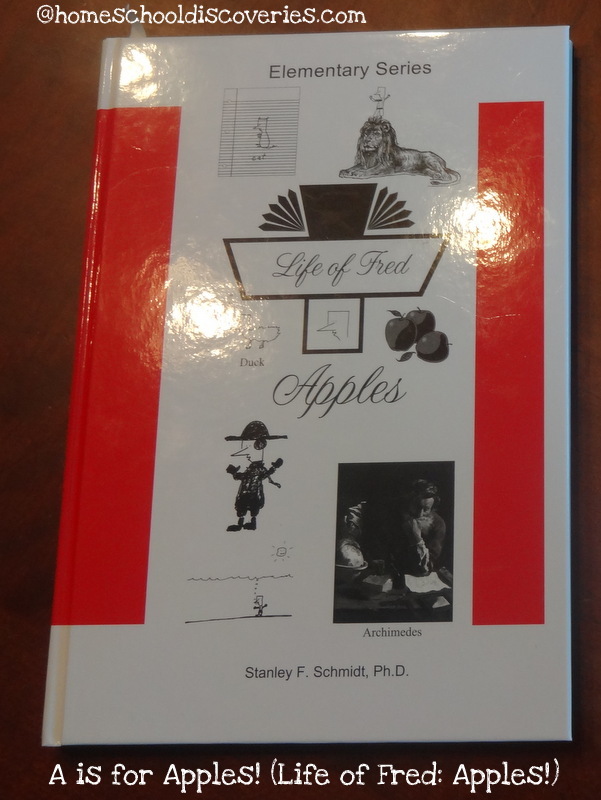 A great math book called Life of Fred: Apples. Life of Fred is a unique series of math textbooks. While previous books in the Life of Fred series were for late elementary school or middle school and up, the Life of Fred elementary series (beginning with Apples, of course) starts out at a level even most Kindergarteners can understand. Life of Fred is a very unique series of math books — they tell a story! Each book tells a little more of the story of Fred, a very unusual college math professor who happens to only be five years old. Basic math concepts are interwoven throughout the humorous story about Fred’s day. 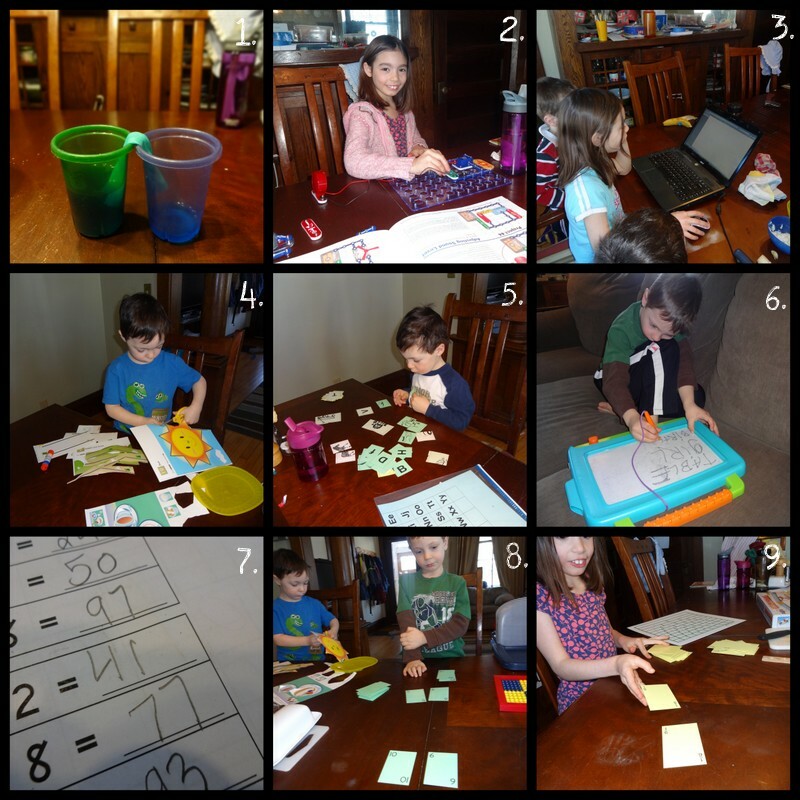 In Life of Fred: Apples, readers learn about addition facts that equal seven, calendar and time concepts and some basic instruction about sets, among other things. At the end of each chapter a short “Your Turn to Play” section gives readers a chance to practice the topic in the chapter with just a few (generally about 3 to 5) questions. As I mentioned, many of the concepts in Apples are fairly simple. Even Mr. E is “beyond” several of these concepts in his regular math book. But since Life of Fred is a series of story books, it makes sense to begin at the beginning. All three older kids (Miss M–8, Mr. E–almost 6, and Mr. K–4), really enjoyed listening to Apples, and were eager to begin the second book, Butterflies, right away after we finished it. Is Life of Fred a replacement for a regular math curriculum? At the elementary level it is a bit hard to imagine that this would suffice as enough explanation and practice for most students. A motivated parent might be able to fill in the gaps and provide other means of practice to go along with Fred. Or they might make a nice “break” for a student who is struggling or burned out on their regular curriculum. 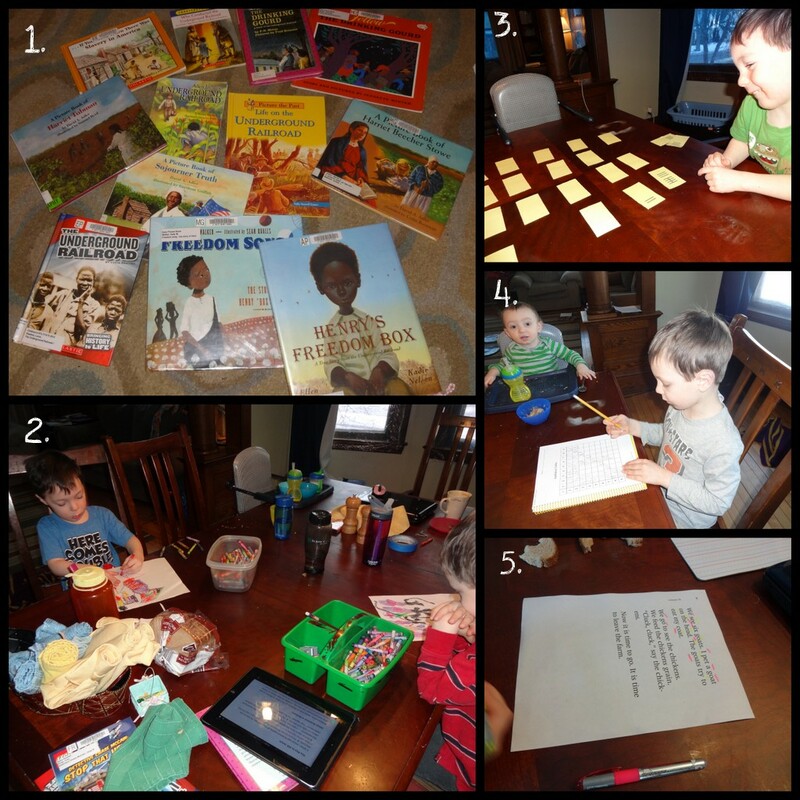 To see what other bloggers are writing about for the letter ‘A”, visit this week’s link-up at Ben and Me! So, raise your hand if you are still tired in the mornings even though it is has been almost a week since the Daylight Savings time change??? I know we certainly are. 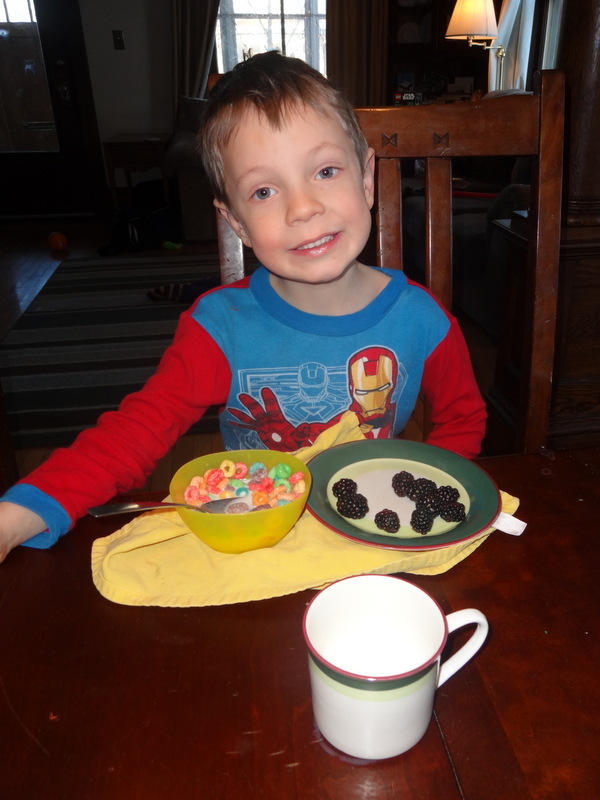 Surprisingly enough, Monday wasn’t too bad — we prepared for our day the night before and even got an early start on school. It was all the other days that we had a hard time getting going. Hopefully next week will be easier in that department! 1. History: Miss M (age 8, 3rd grade) has been reading like crazy about slavery and the underground railroad the last two weeks. One book didn’t even make it in the picture, so she has read 13 books from the book basket already for this unit. Given her speedy reading pace, we’ll probably only spend about another week or so on this topic. I’ve read a couple of these picture books aloud to the boys and hope to read a few more to them next week. 3. Math Games: I played Bead Card Memory (a RightStart A game) with Mr K on Monday night while the big kids were at a volunteer opportunity with Tony at our neighborhood boys and girls club. I played Addition Old Main with Mr. E this week and Multiplication Old Main (both RightStart games as well) with Miss M.
4. Math Lessons: Mr. E started RightStart C and completed lessons 1-5, which are all review. He is enjoying making an addition table. Miss M started the Fractions chapter in Math Mammoth 3-B. It was mostly review with a few new concepts and a few “old” concept presented differently. Miss M really took issue with Math Mammoth using the term “pie models” (RightStart doesn’t use these at all) to describe fraction models that weren’t circular. “Mom, pies are NOT shaped liked hexagons, octagons or pentagons!”. LOL! 5. Spelling/Phonics/Reading: Mr. E finished 4 lessons of Logic of English Foundations. He isn’t always too excited about the reading that comes with the curriculum (he would rather read a real book), but I have him read some of the Foundations workbook exercises anyway. This week we discovered that reading with a hi-liter in hand made reading it SO much more exciting! He chose to highlight all the long vowels and two letter phonograms after he read each sentence. Miss M worked on lesson 29 of Logic of English Essentials for spelling. This was probably her hardest list ever in this program, and she got more wrong than right on the test. Good thing next week is a review week so we have time for more practice on the ti/ci/si phonogram words! Mr. K just practiced his phonograms with the LoE app this week. 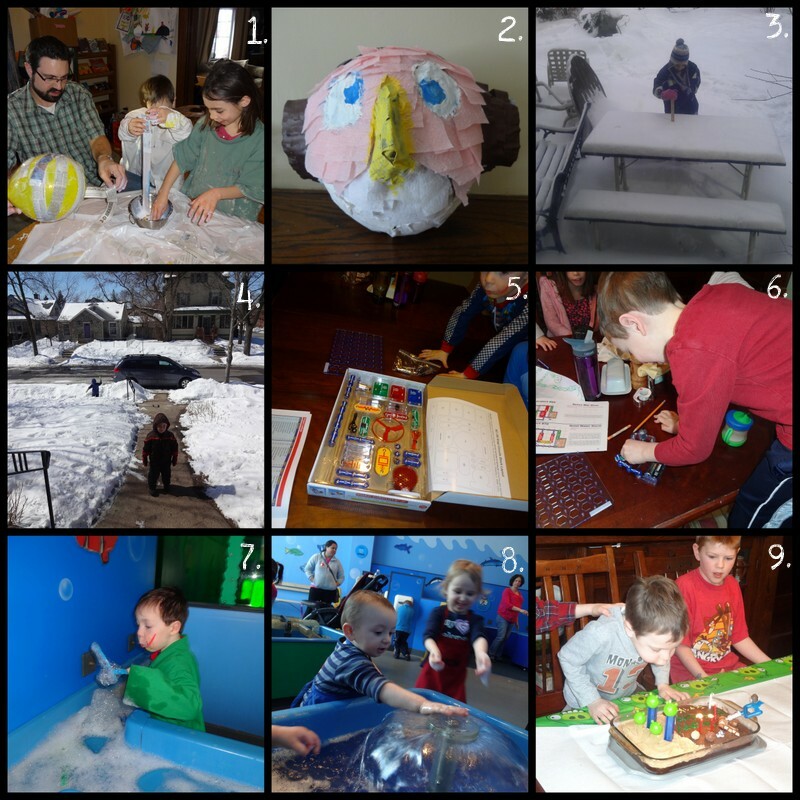 Science (not pictured): I’m starting to see a pattern in our science studies…the weeks I teach the 1st/2nd grade science at co-op, I have a hard time pulling together a different lesson at home. 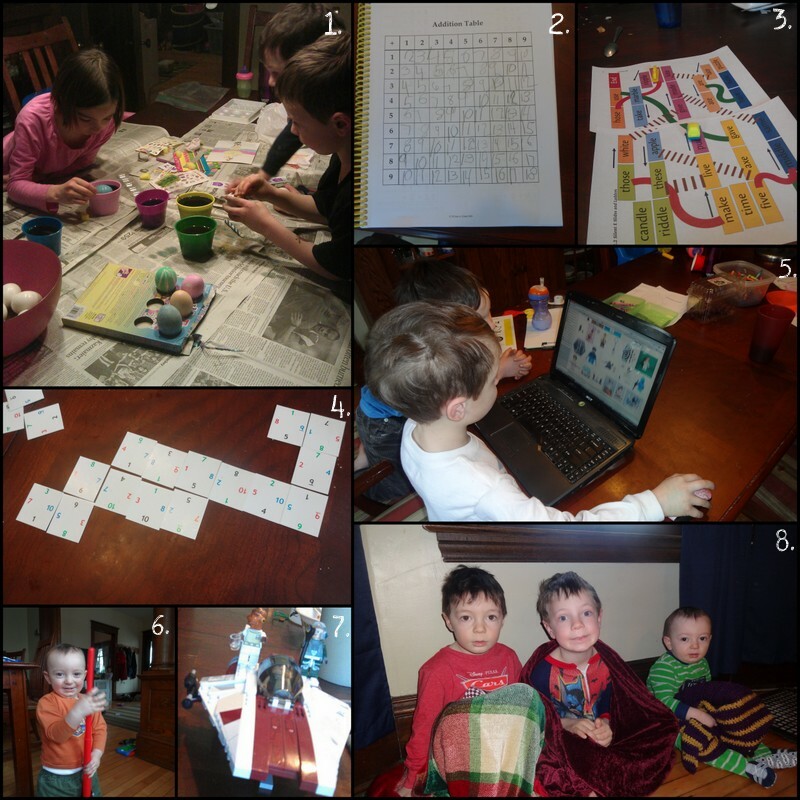 So, my kids got a review of BFSU 1 lessons D-1 and D-7 on gravity, as well as watching a bunch of youtube videos on the topic and a magic schoolbus episode about gravity. We watched a couple other Magic Schoolbus episodes as well. Next week, we’ll be back to a lesson in BFSU Vol. 2. 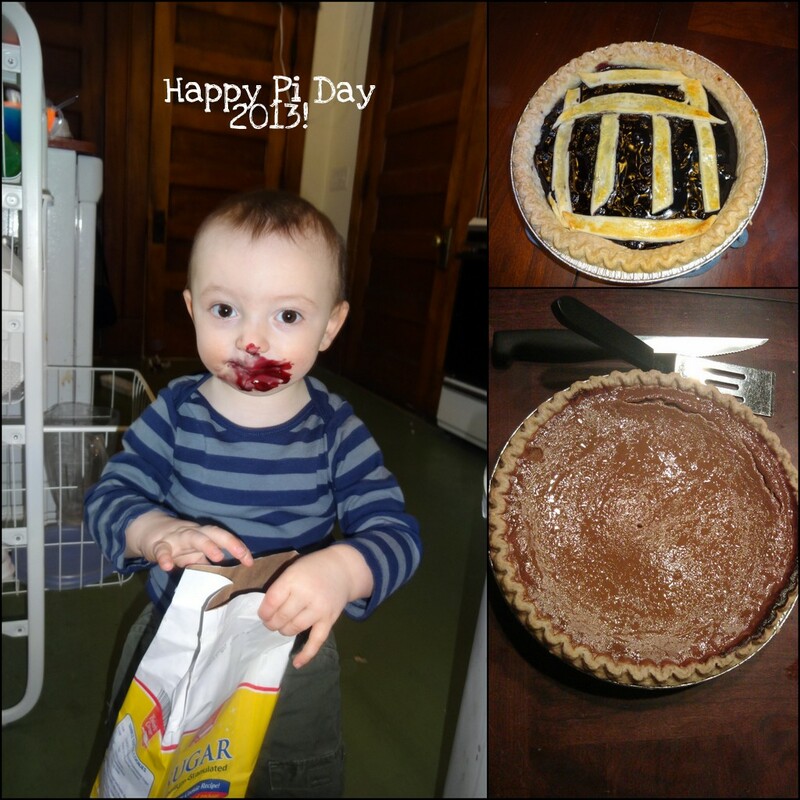 Most of our celebrating this year was of the eating variety, but we did re-read Sir Cumference and the Dragon of Pi. 🙂 I brought the “pi pie” (blueberry in flavor) to co-op for my students along with a store-bought turtle pie. My family wasn’t too disappointed that I brought home most of the blueberry pie. Miss M made the Pumpkin pie in the lower right corner with just a bit of help from me with the pesky can opener and moving the over-full pie to the oven. “CT” Mr. J (“Cute Trouble”, 16 months old), helped himself to the lid of the pie filling can (don’t worry – it wasn’t sharp!) and an empty-but-for-a-few-crumbs bag of sugar for a tasty treat while I was a bit too focused on helping Miss M with her pie. 2. We attended the monthly Family Day at the Minneapolis Institute of Art last Sunday. This month’s theme was “cityscapes,” so we made skyscraper hats! 3. Besides playing math games while his big siblings were gone on Monday night, he got to bake cookies! Peanut Butter Kiss Cookies from a cookie mix are just the right speed for a 4-year-old, and he could do almost all the work himself! 4. and 5. With just a tiny hint of spring this week (aka, temperatures above freezing in the mid to high 30s a couple of days), the kids begged to make mud pies. I let them, despite the mess it caused requiring immediate baths and laundry afterwards! 6. With the leftovers from her pumpkin pie, Miss M created this cute mini-pie and a couple of “cinnamon pie crust rolls”. Those treats were her personal Pi Day dessert!